Eagle Water Transfer PU HD Lay Flat Hose - JGB Private Brand - Hose by Vendor - JGB Enterprises, Inc.
JGB's Eagle Water Transfer PU is coupled with forged fittings versus sand casted fittings, making them the strongest in the industry! Construction sites, waste water industry, agriculture and mining, transport of abrasive materials, flexible pipeline even in extreme terrain, irrigation and sludge disposal, for heavy duty service under toughest conditions. Perfectly prepared for hydraulic fraction in shales and oil fields. 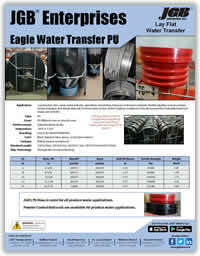 JGB Eagle Water Transfer PU 200 PSI for 8", 10", & 12" Heavy Duty Lay Flat Hose is made from thermoplastic cover and lining around polyurethane (TPU) circular woven jacket made from high tenacity filament polyester yarn. The heavily reinforced weave ensures minimum extension in length and minimum “snaking” of deployed hose.